Inspiration comes from seeing, doing and teaching—and knowing that each step makes a positive difference in one’s own life and the lives of those around us! Science, technology, engineering and mathematics can help to pave the way to a better future across the world. But communicating experiences as well as hopes and dreams through the perspectives of art, design, music, culture, dance and storytelling are the motivation for change. 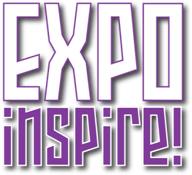 EXPO Inspire is an all-day event with hands-on activities for kids, students, teacher, parents and all adults! Design and launch an Alka Rocket. Follow the bee as it pollenates a flower. Learn the Science of Magic. Study the stars in the Planetarium. Walk The Edge exhibit. Catch reading fever with Book Fairs. Participate in design challenges. Sing with astronomers and meet astronauts, with talks, live entertainment and much more. The EXPO is an exciting, fun, learning experience to explore the universe of space, science, technology, music, careers, professional educator development, new trends, nature and adventure. Experts and novice will find an engrossing, immersive, and energizing experience.